I can't even begin to tell you how excited I am to share my latest project with you- I've been working on it for a couple of months now, trying to figure out the whole system before I present it to my students, and I'm finally ready to use them in my classes this week! My problem: I didn't like the idea of trying to glue stuff to puff balls. Trust me, I've done stuff like that before, and it's not pretty. You get little strings all over the glue bottle (or gun, or stick, or whatever you're using to administer adhesive), and it's a struggle to get the bottle away from the strings of glue each time without creating a sticky cobweb all over your face and clothing. 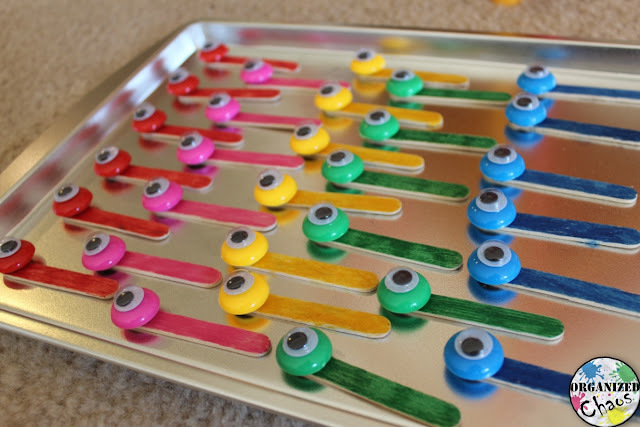 I also wanted something more durable- if I'm gonna take the time to make so stinkin' many little monster thingies, they better last for years (and be used by hundreds of students)! So these thoughts have been percolating for about a year, and this summer I finally landed on my solution: magnets! If you've been around a while, you know that magnet boards have become one of my standard fall-backs. 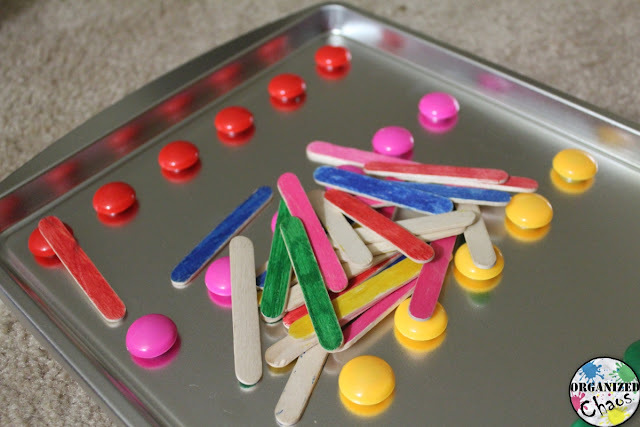 They are durable enough for little hands, the materials are pretty cheap, and there are a wide variety of options readily available for materials as well. I will admit, this is no one hour project. If you're ready for a commitment it could probably be a weekend project, but for me I needed to pace myself so I didn't get mad and throw the whole thing out the window- it definitely requires some patience to make everything. But I am THRILLED with the results! To make the basic set with quarter notes, paired eighth notes, and magnet boards, you'll need some magnets (I got these), googly eyes (I had some laying around from my kids' craft supplies but these are the same variety/sizes), craft glue (or better: super glue), and cookie sheets (I found mine for 88c at Walmart). 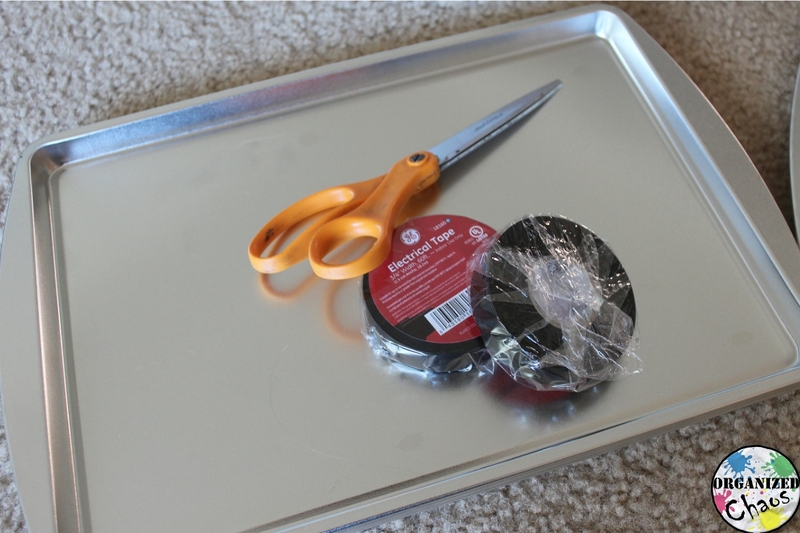 You'll also probably want electrical tape, but you could achieve the same effect with a black sharpie/ paint pen too (more on that later). 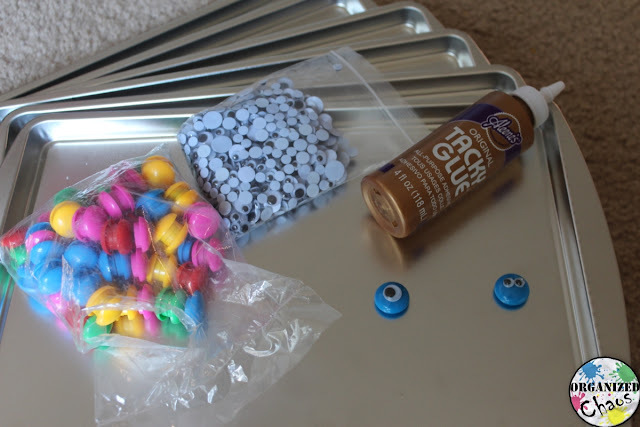 You can see the trial versions I made, to see how well the glue would hold, in the above picture. So far they are holding up just fine- definitely get glue like the kind you see in the picture. I borrowed some from my art teacher colleague, but you can find it at any craft store. I wanted to be able to use my monsters for melodic composition as well, so I made one quarter and one paired eighth in each color and made 7 sets (one for each color group that I have set up for small groups in my room, plus one extra). Since there are 5 colors, I can assign each color to a note in the pentatonic scale for my older students to create melodic compositions. 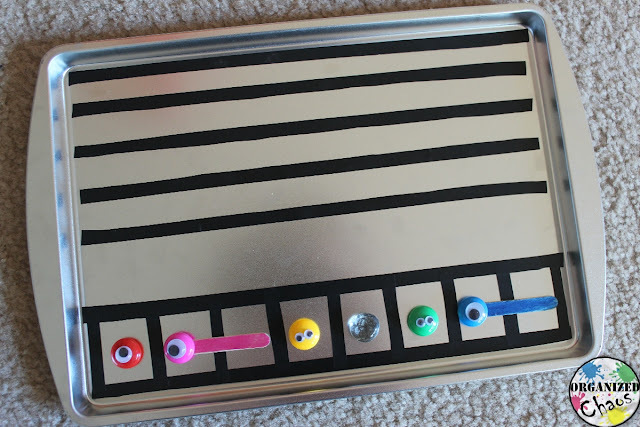 For kindergarten I won't attach any meaning to the colors, and for first and second grade I will give them only enough colors for the notes they are using (sol and mi or mi-sol-la, respectively) if I decide to do anything melodic with them. 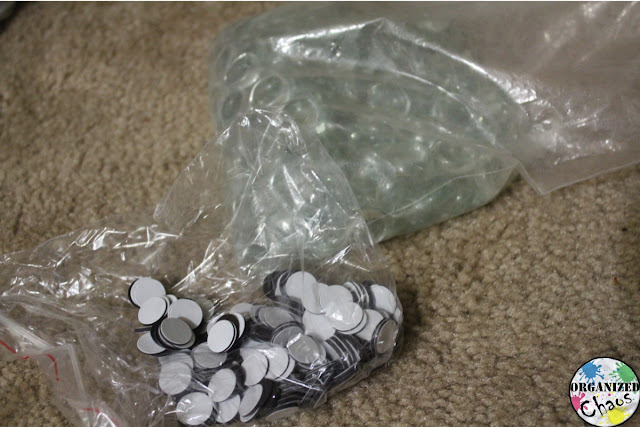 For the quarter rests, I bought some clear marbles that have a flat base (made for aquariums and vases and such) and stuck a magnet dot on the bottom. 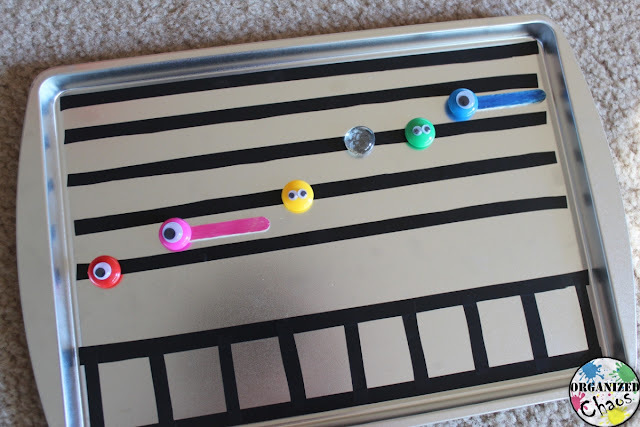 I love this idea because the students can see that the rest takes up a beat but it has not sound- I thought about just using magnets with no eyes but having something transparent seems clearer to me (no pun intended). 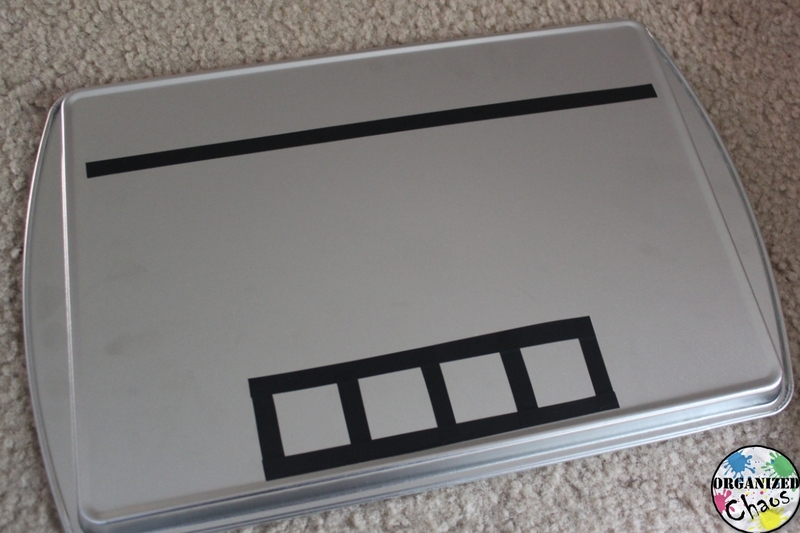 The magnets fit perfectly on top of the width of the tape and I was ecstatic! And then I remembered the constant struggle I encounter with students who draw notes "on the line" either above the line or barely touching the line. I needed a way to have them practice and see the line going through the middle of the note head. (Hi, have we met? I'm Miss Obsessive-Perfectionist. Nice to meet you.) So back to the drawing magnet board I went, and I started cutting the strips in half length-wise. Let me tell you, this is where the tantrum almost kicked in. I finally bit the bullet and got myself a paper trimmer for $10 at JoAnn's and there was peace throughout the land (seriously, why did it take me so long to get one anyway?). Are you as excited as I am yet??? Because this is SO COOL!!! 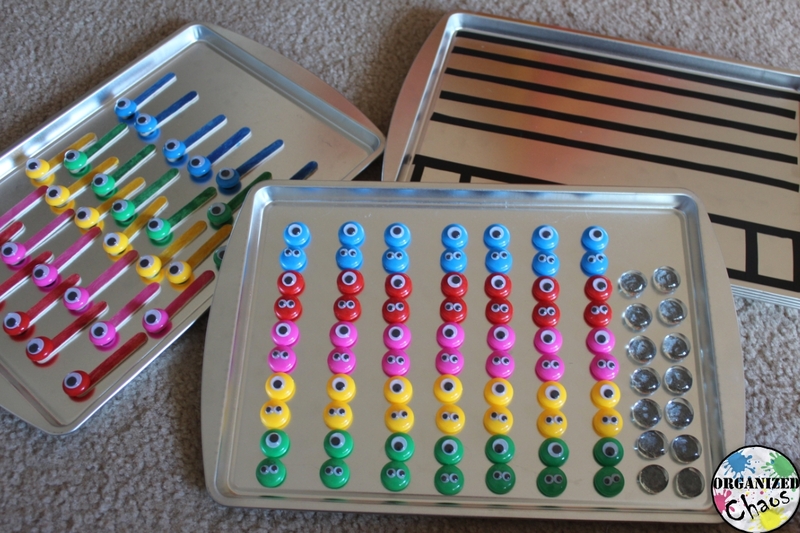 I also put a simplified setup on the back of each cookie sheet, with just a line (for unpitched composition) and 4 beat boxes, for my younger students to use. I made 6 cookie sheets (one for each color group in my seating chart- each group has 2-4 students depending on class size). All together, I spent just under $30 for this project (I already had magnet dots and googly eyes on hand- add a couple of dollars if you need to purchase those), and I have a set of composition manipulatives that I hope to use for years to come! 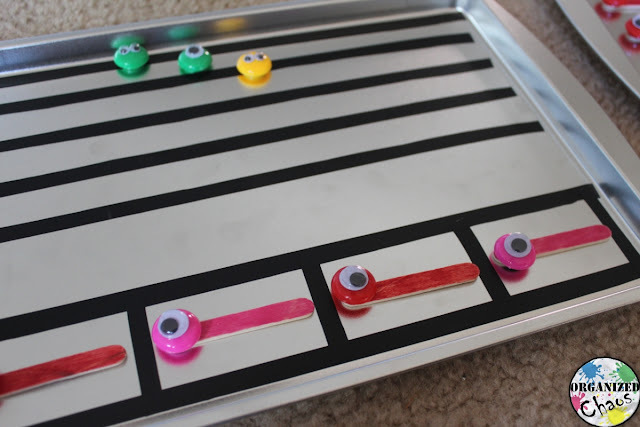 I am excited because I think my monsters will help students better understand the rhythmic and melodic concepts they are practicing, get them used to creating their own rhythmic and melodic lines, and engage them in a fun way! What are your favorite strategies for getting lower elementary students composing? 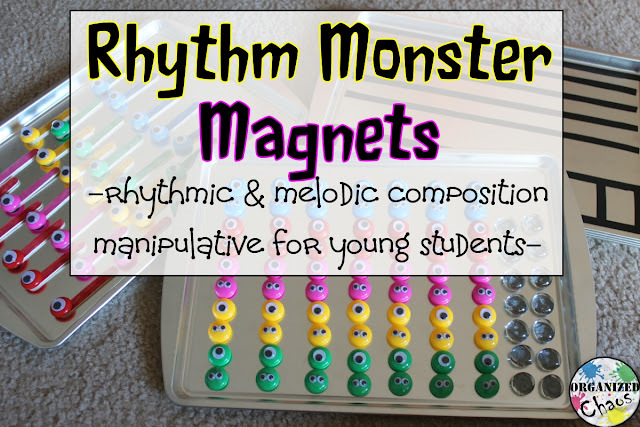 Do you think you might want to create some rhythm monster magnets for your own classroom? Share your thoughts and ideas below! Just checked out your "If You're a Monster and You Know It" idea and I love it! I had never heard of that book before. And yeah, you're smart to plan on having it ready for next year and not sooner. It is definitely not a quick and easy project! I can't wait to see yours when you're done, I'm sure your kids will love them as much as mine do! They were a huge hit this week! I really like this idea. 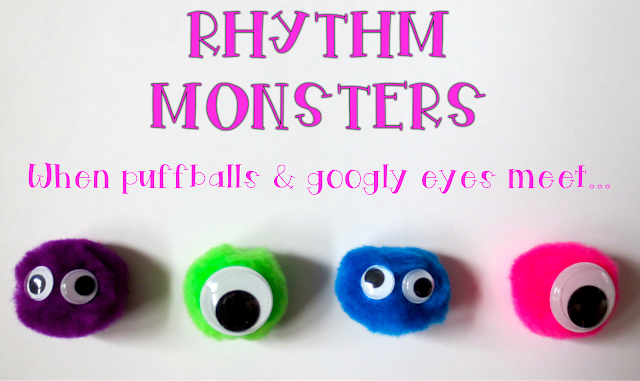 I already made the puffball googly eye rhythm monsters this past summer. An easier way to make the staff lines would be to go to an automotive store and buy black pinstripe tape. It is already thin enough. It may cost a bit more, but it would be quicker. 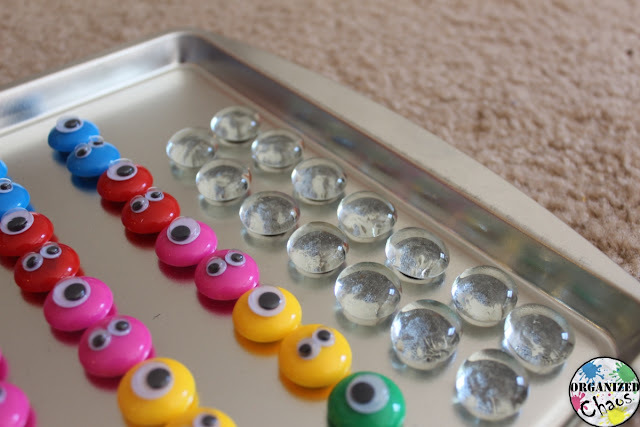 This idea could make a good center activity. I have used it in centers a few times and it has been really fun! 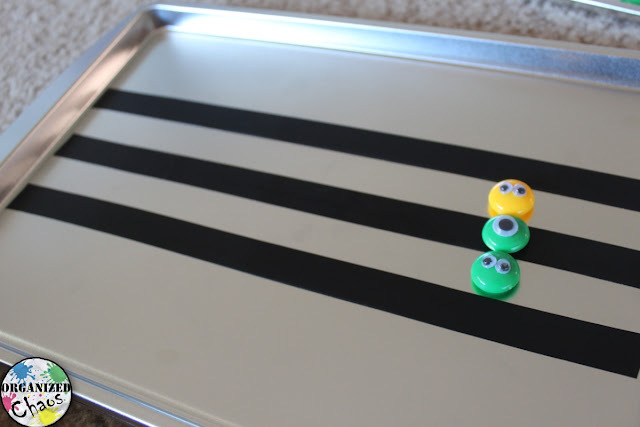 I think the main thing is to make sure to have students use them enough to know how to use the monsters and the board properly before doing it in centers, or else they will just use them as toys and not as rhythm manipulatives ;) Thanks for the tape tip- I know I have seen the thinner tape before but I didn't know what it was called! Getting ready to make these! Such a great idea! How did they hold up through the year? Did the googly eyes hold? Thanks! Great question! :) Most of them held up great- I did ask students to handle them gently and most of them were fine. 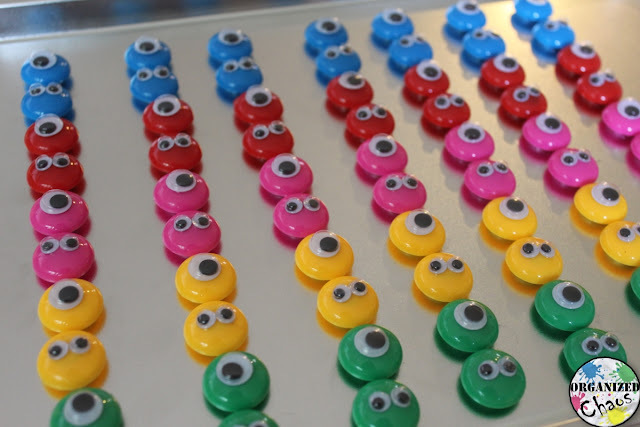 The ones that did lose eyes were the ones I made in the beginning without as much glue- the key seems to be adding a larger glop of glue. I'm repairing my broken monsters this week actually! I would suggest making a few extras of each type so that if one does happen to get lost or damaged you have some extra ones on hand to give the students. I had maybe 3 extra of each kind and I was fine all year. I am not a teacher, but like the idea you have here. I do know possibly those in church who have childrens choirs and don't know if they could do this or not but it looks great! Hope your class learns a lot and is able to progress beyond what you have done! !